I waited (of course) until the night before I check out to find the hotel swimming pool. After a month's hiatus, boy am I out of shape. I was struggling to breathe after a few hundred yards. Then I made the mistake of pacing out the length of the pool. Never a good idea. It was only a 12.5 yard pool and my hundreds of yards were stripped away faster than a tour victory after a positive drug test. I woke up to another cold (58 degrees in July?) and rainy day here in Berlin. The plan had been to go out dancing last night then sleep the day away, but somehow I couldn't make it past midnight (maybe the huge dinner had something to do with it). I remembered last Sunday in Hamburg when everything but the restaurants closed. Same in Berlin, only more so. I couldn't find a cup of coffee at 8 a.m. - not even the 24 hour restaurants were open! I was forced to resort to making of cup of instant coffee in my room. Ach de leiber! 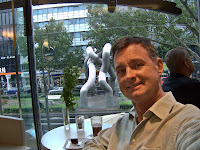 After that delicious breakfast I took a bus to the Reichstag (their Capitol building) then walked to the Museum Island. There were long lines outside in the rain for the museums, none of which interested me that much anyway. Instead I sat at an outdoor cafe for lunch with my rain hood up to keep dry and warm. I wish I had carried my waterproof camera today, that would have been a great photo! 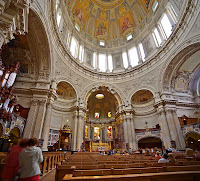 Also on the island was the Berlin Dom (cathedral) which was typically baroquely ornate. 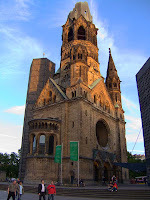 Actually, appearances otherwise, this church was built in the 20th century then rebuilt after the war. 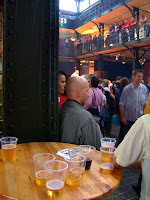 I kept looking and looking to get a photograph which might show the characteristic architecture of Berlin. Not possible, there is no such thing. I climbed to the top of the Dom and got this photo which shows what I mean. Basically the city was bombed flat in World War II then cut off from the outside world until after the wall came down. A lot of the east side is comprised of huge mostly six story apartment blocks. The west side is a hodgepodge of styles, much of it built in the past fifteen years. Although not esthetically appealing to me, I do appreciate the tree lined streets and great public transportation. There are a lot of fun modern buildings and the new central train station is impressive. So, what to do on a cold rainy day? Go to McCafe, of course! Here I am with a cafe mocha and brownie. Hey Starbucks, notice that McDonalds has fresh flowers and a candle on every table! 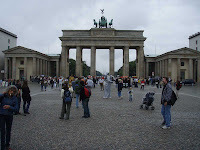 I don't know why, but when I crossed today under the Brandenburg gate from the former East Berlin to freedom on the west side, I was moved to tears. It was probably just fatigue from too little sleep; OR it could have to do with knowing Doug's aunt Angela who was split from her family by the erection of the Berlin wall. 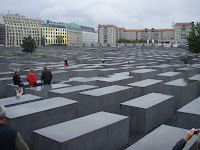 The Holocaust memorial is a block from the gate and it was quite interesting. It is huge and something that has to be experienced in person to be appreciated. Just looking at it wasn't enough, I had to walk through it a bit to get the impact. I tried video, but that couldn't capture the sense of the place either. Okay, time for a nap in preparation for clubbing - night two. I noticed I was getting a little depressed in my last days in Prague. Now that I am in Berlin it suddenly makes sense. I was delighted by some of the parks in Prague - and "delighted" was not too strong a term. 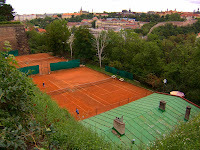 I realize now that while there are lots and lots of parks throughout Prague, if you are not in a park there is no green to be seen anywhere. Just block after block of six story buildings with beautiful plaster facades, cobblestone sidewalks and cobblestone streets. Lovely at first, then monotonous and dreary. The parks were almost shocking in contrast. Also, nobody who lives in Prague ever smiles. At least not in public. Here in Berlin I see the usual mix of people, but I also feel a real energy and see people smiling as they walk down the street. I got an immediate boost to my mood as soon as I got off the train. Part of the reason I came to Berlin was to experience the night life (don't tell Doug). I went out to a dance club at two in the morning and it was hopping. I danced for more than hour (mostly techno house music at this club) and left at four in the morning as the dance floor was getting too crowded with new arrivals and the sky was getting light. Which leads me to the title of this post. On my way home I passed a few restaurants that were still open, but wasn't really interested in pork and sauerkraut at this hour of the morning. Then, behind my hotel I came across a McDonalds. The ground floor was the usual McDonalds experience, but the next floor up was their answer to Starbucks, the McCafe. I had a piece of coffee cake and a large hot chocolate - an absolutely perfect end to a fun night out. Thank goodness for McDonalds. Not More of the Same!?! This photo is a panorama which I took yesterday. I am excited about seeing the large print, the amount of detail in the full sized image is amazing. This gives you a sense of the normal state of activity on the Charles bridge. Here I am on the Charles bridge yesterday. As you can see I have put on some weight. No, I have not died my hair - I am the one standing by the lamp post! Today is a travel day and I am off in a few minutes wending my way to Berlin for the weekend. I do not have high hopes for Berlin, but then I have been pleasantly surprised throughout this trip (to say the least!). This photo is for Doug who likes it when I frame the image within the photo. You may recognize the tower from my moon shot the previous evening. 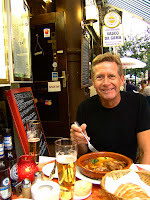 I have noticed repeatedly in these densely touristed areas that all you have to do is walk one block off the beaten path and the streets are empty. 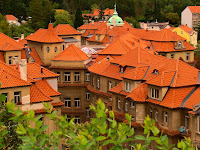 This shot was taken only one block from the Charles bridge where the restaurants and shops were packed. I woke up late from a nap yesterday to find my dining options limited. Three businesses are open 24 hours a day and you can see at least one from wherever you might happen to be: McDonalds, Kentucky Fried Chicken, and Little Caesars. I got on one of my usual trams to check out a different area. It took me a few stops to realize that I was the only one on board and that I was way out in the suburbs somewhere. I also knew that the trams stopped running around that time. Panic started rising so I got off. It seems there were some Americans in the car before mine which were in the exact same situation. Suddenly I didn't feel so bad. We crossed the street and a tram soon came along heading back into town, and all was once again right in the world. 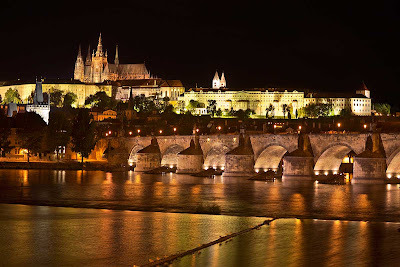 I leisurely strolled the Charles bridge taking the photos you see here. Please enjoy. I got up at 4:30 this morning in hopes of getting photos of the famous Charles bridge without hordes of tourists. I needn't have bothered. There were even fewer people on the bridge after sunrise than before (lots of rowdy guys singing their way home after a late night out). By the way, I did some research online and discovered a little secret about the dumplings I've been eating. Click HERE for the recipe (and a photo which looks a lot like the one I posted yesterday!). From the several cathedrals I've been in I've noticed they all look pretty much the same - way over the top. Okay, not many words today, just lots of photos. Enjoy! I headed out the door this morning and turned right. I don't do any research before I travel (I had no idea where the Czech Republic was before I got here) and trust my feet to lead me to interesting places. Once again it worked. 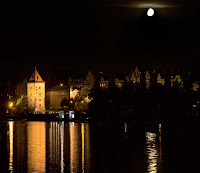 I climbed a steep hill to the south of my hotel, passed through a tunnel in a massive wall and emerged into the large hill top fortress of Vysehrad (click HERE for more information). All that is now enclosed in the walls are a chapel, cathedral, cemetery, and large park. I walked the top of the wall most of the way around and enjoyed the views of the city (and for Doug the tennis courts nestled along the outside of the wall). After taking the hundred plus stairs back down I hopped on a tram (or trolley or whatever) and zipped off on another adventure. 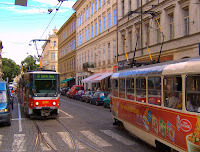 Even though the electric lines over the streets which power the trams are an eyesore, the trams are worth it. Especially when I am tired from lots of exploring; by the time I get to my destination I am rested and ready for more. They zip down the middle of the streets and are fast, quiet and offer nice views. Public transport in both Hamburg and Prague operate on the honor system. I can get on and off as often as I like without having to show a ticket or jump through any hoops. I purchased a one week ticket and carry it in my wallet because it is the honorable thing to do. Anyway, I went to a building which caught my eye in the distance yesterday (the national museum) and followed the crowds to an area that was new to me, the old city. Touristy, very crowded, but lovely. I got completely lost in the winding streets. So, not knowing where I was, I decided to have lunch. 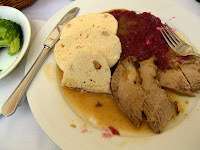 My entree at lunch once again included slices of a very large dumpling, not dissimilar in texture to soft bread. It goes great with the purple sauerkraut which also seems to accompany each meal. I can't help myself. Somebody stop me, I have gone out of control. I had a couple of moments today when my chest constricted and I had difficulty breathing; the vistas were that beautiful. Then I just started shooting. "If it is this beautiful, how could I take a bad picture?" was what I felt, as everything I've ever learned about photography went out the window. But, of course, the photos ended up looking exactly like every other tourist's photos. But in this magnificent city, that isn't all bad. It is hard to explain, but individual buildings here aren't all that interesting; it is their uniform style and the way they all fit together which is so stunning. 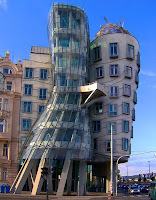 One exception just around the corner from my hotel is a building which was obviously designed by Frank Gehry. The castle and cathedral on top of a hill dominating the city skyline is another exception. I took way too many photos of that hill, and know that I will be taking more before I leave. I stumbled across a hidden restaurant on an island in the river for lunch. 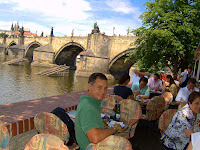 I sat at a table on the edge of the water with the BEST view of any table in Prague. No question about it. The photo of me was taken by the waiter, the other photo was taken by me sitting at the table with the same camera (usually waiters at scenic spots take better photos than this). By the way, remember that you can view a larger version of each photograph on this blog by clicking on that image. You will then need to use your browser's BACK button or arrow to return to this page. I won't waste your time by posting them here, but I did manage to get three spectacular panoramic images which I look forward to seeing full sized. Doug took off for Maui early this morning and the sky wept. Alternating between a light rain and steady downpour, this was my first rainy day of the trip. I wandered the streets homeless, soaked and cold waiting for my evening flight to Prague. 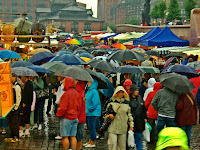 I got to the Hamburg fish market amid flowing streams of umbrellas. Early Sunday mornings they hold their larger version of the Maui swap meet along the river where fishing boats used to sell their catches. Nothing out of the ordinary until I got to the old fishmarket building. The only thing being sold there was beer, beer, fried food, and more beer. A band was performing, hundreds of people were staggering around or sitting at long tables, always drinking. And all this at 7 a.m. on a Sunday morning (click HERE for the video). Come to think of it we've noticed people drinking beer in the parks and on the streets at all hours of the day. Continuing my sodden wanderings I also noticed that the seedy bars which did not open until midnight on Saturday were still going strong at 9 in the morning. Other than the bars and a handful of restaurants, the city was closed for business. What a huge contrast to Saturday when the streets were packed and all of the stores were busy. I had heard that Germany shuts down on Sundays and now I've witnessed if for myself. All that I've seen of Prague so far was on my taxi ride from the airport, but I'm struck by a sense of tidiness. The taxi was spotless, the driver wore a tie, the buildings are clean and graffiti free. I am reminded of the Vienna I visited twenty plus years ago. All of Hamburg it seems is out strolling the streets on this beautiful summer day. To entertain them we saw the ubiquitous mimes, a talented string quartet, people playing instruments I've never seen before, and a cheerleading squad. Our favorite entertainment involved a raft in the lake upon which a real putting green was growing and a tee on a platform on the shore. We were not shy in critiquing their strokes and choices of clubs even though we would have put many people (and fish) in harms way had we given it a try. 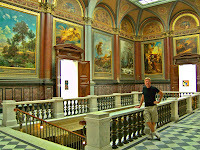 We thoroughly enjoyed visiting Hamburg's leading art museum the Kunsthalle (click HERE for the link to their site). We appreciated not being overwhelmed with too much art, instead we got a nice review from medieval times through the present. It seems we were the only ones to have read the reviews of the hottest dance club, because we were pretty much the only ones there. Our late night out was a bust. After a late dinner we are going to tempt fate and try a different club tonight. 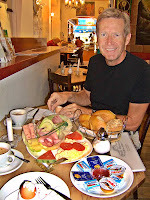 Breakfast this morning was definitely German: hard boiled eggs, sliced meats and cheeses, bread and more bread. I think I'll go to Starbucks tomorrow before leaving for Prague. Doug returns to Maui tomorrow. How sad for both of us. It has been a GREAT three weeks. Doug and I both lived in Chicago for twelve years before moving to Maui. Our Hamburg hotel's neighborhood is almost indistinguishable from our old haunts in Chicago: the same narrow tree lined streets, brick, brownstone and graystone apartment buildings, the restaurants, bars and shops - it's all the same! We feel like we have stepped back into our old lives. Unlike Maui, ethnic restaurants abound here. Strangely enough our past is catching up with us in another way. In Portugal we could only find Irish pubs, here we are finding mostly Portuguese restaurants such as the one we ate at tonight. This one specialized in wild game - delicious! And not just p.r. wild, I had to pick the shot out of my pheasant breast. Doug ate wascally bunny wabbit in a wed wine sauce, which triggered memories from long ago of his pet rabbit, Mr. Pooper, the meanest rabbit that ever lived. 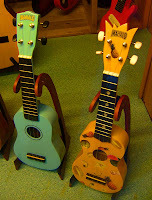 We got a little taste of home in a musical instrument store window this afternoon where we spotted some Mahalo Ukuleles for sale for 30 euros. Non smoking areas are becoming commonplace throughout Europe, but there is still a lot of smoking. We've even seen a fair number of people smoking while riding their bicycles. The image which struck both of us this afternoon was of a guy riding by on his bike, cigarette in one hand, open beer bottle in the other, alternating puffs and drinks. 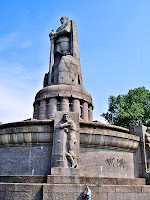 We stumbled across a massive stone monument to Bismark at the top of a hill we were climbing (if there's a hill, we go up it). Notice how small I am in comparison. Okay, it's almost midnight on Friday. Time to head out and check out the dance clubs. Could I Be Any More Relaxed?